The Black Diamond Momentum DS Harness is their most versatile all-purpose harness, featuring maximum adjustability and range of fit for entry-level use. The Black Diamond Momentum DS Harness uses Dual Speed Adjust buckles on both the waistbelt and leg loops allow for an incredible range of adjustment for multi-season and multi-climber use, while the tall, bullhorn-shaped waistbelt improves comfort during long belays. Very happy with this harness. It’s suitable for different disciplines and has two buckles on the waist for perfect adjustment. I tried out a whole bunch of different harnesses from DMM, Petzl, Mammut and others and whilst all good this one was just better. It's so light and comfortable that you forget you are wearing it! And yet it is well-made and fills you with confidence. If it was lost I would buy it again in a heartbeat. I admit I had some doubts about the shape of the waistband with that dip at the back but it is really comfortable and a non-issue. The speed buckles are really quick to tighten up but quite tricky to release, or maybe I just haven't got the knack yet, but they don't slip at all and that's what matters. In terms of sizing I am 6'2", over 15 stone and have large thighs and a slim waist for my height. This harness is *really* adjustable and many different sized friends (male and female) have worn it without issue. That said, even though I bought the L/XL and the waist is almost closed on me (I am 33", it states 30" as the small-limit and it means it!) the thighs are at their limit of safe opening! 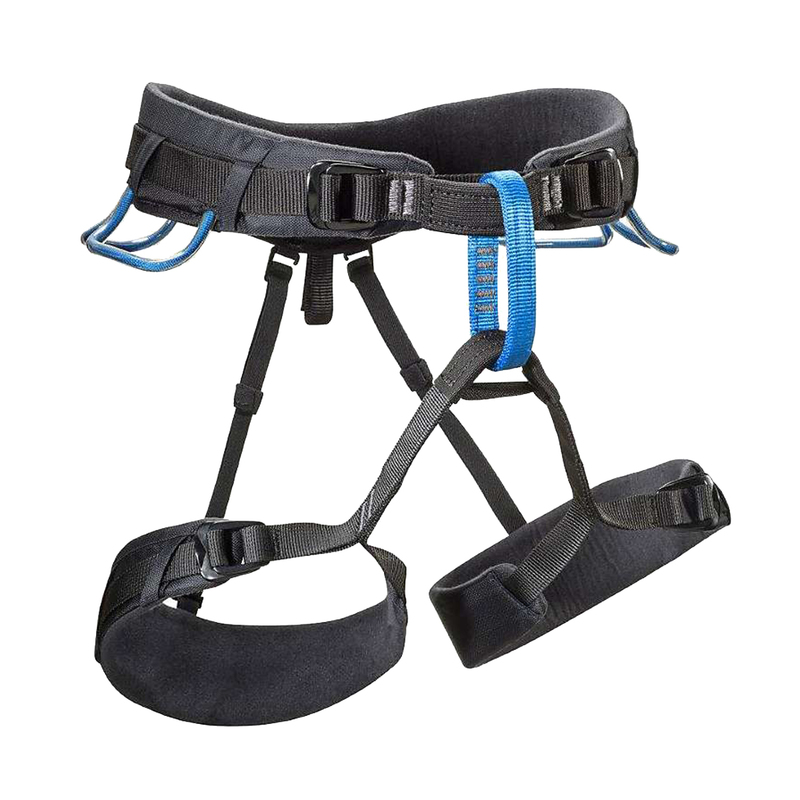 (2"/6cm tab left free) It's very definitely a 'male' sized harness aimed at thinner legs. If you have Schwarzenegger thighs you might want to try before you buy. Quality in great price. Really fast shipping. Got this harness for my girlfriend at the very reasonable price of €30. As a harness is not usually the piece of gear you want to cheap out on, I was reassured by the fact that I have several other black diamond products that are of fantastic quality. So glad I went for this in the end. It's designed to be very adjustable so she gets a very good fit from it. Bearing in mind that her only experience is with dirty old rental harnesses, she has also said that the Momentum DS is very comfortable. Overall, a very good harness for a beginner or anyone who values adjustability and comfort above all else. At €30 this is an absolute bargain but even at full price it is worth considering.